This recipe is the gastronomic demonstration of the Aristotelian pronouncement that “there is no great genius without a mixture of madness”. Tuna on veal is pure genius. As crazy as it must sound to some of you, a fish based sauce on beef is a marriage made in heaven, it totally works. In fact, it’s been working for a long time as this famous Piedmontese appetizer has been first published by no less than Pellegrino Artusi in 1891. And if you think about it, the combination of fish and meat is not even too odd. Consider the widespread use of fish sauce and oyster sauce in South-East Asian cuisine. Consider the importance of garum in the cuisines of ancient Greece, Rome, and Byzantium and of Worcestershire sauce in modern Western cuisine. Did you ever realize it’s a fish sauce? And how about paella, gumbo and fish wrapped in bacon? OK, bacon is no beef but they all are fantastic examples of fish and meat combinations. For me vitello tonnato is a memory of summer which is the only time it makes sense to have cold roast. I don’t think my mum ever discovered the recipe was from Piemonte. I am also pretty sure she didn’t know that there are many versions of it, hot, cold, boiled, roasted, with fresh eggs, hard-boiled eggs or no eggs in the tuna sauce. My mum thought mayonnaise was an evil fattening food. As a consequence we adored the version with mayo because we were deprived and this was a treat. I still love it like this, with the meat roasted rather than boiled and slathered with rich, eggy softness. Bring the beef at room temperature. Preheat oven at 150 °C/300 °F. Heat a ovenproof casserole pan over medium-high heat and when hot add 2 tablespoons olive oil. Add the meat and brown it evenly, turning every few minutes. This step will take about 5-10 minutes, depending on the size of the roast. Keep the pan covered to avoid hot oil splatter. Add onion, rosemary and wine, cover again and transfer into the oven. Bake for 30 min. turning every 10 minutes and adding more wine if necessary. Remove roast from the oven and let it rest, still covered and in its cooking liquid, until completely cold. For the sauce, filter the cooking liquid into a food processor and blend it with the tuna, anchovy, lemon juice, capers, mayonnaise until very smooth. Cut the roast thinly and transfer it on a serving plate, coating every slice with the tuna sauce. The veal benefits greatly from a resting time of at least half a day but it’s way better the next day. At this stage, distribute the rest of the sauce over the slices, cover the plate until needed and refrigerate. When ready to serve sprinkle with fresh chopped flat leaf parsley. Enjoy as an appetizer or a light summer main accompanied by crusty bread and a crispy green salad. PS. for a traditional recipe see Frank’s perfect instructions here. i’ve been dying to make this since I first tasted it in Italy 40 years ago. Any you’ve managed to demystify the recipe. Grazie! tank you, it’s actually really easy! “Evil in disguise” 🙂 Bring it on!!! Can’t wait to try it – preferably at your hands one day . . .
Anche mia mamma lo fa arrosto! E viene più buono… Approvo! grazie Gaia! evviva le ricette delle mamme! Thanks so much for the shout out, Letizia! 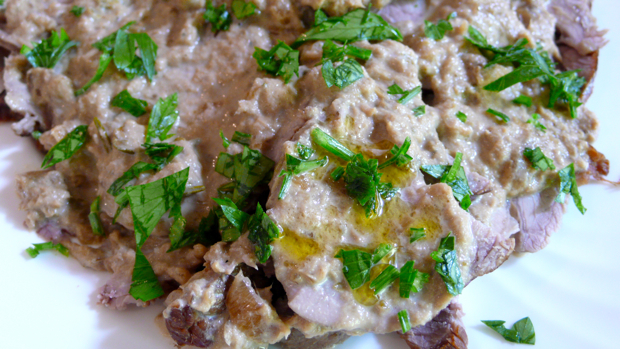 Next time I make vitello tonnato—and I’m well overdue for my fix—I’m going to try it your way. Sounds *very* nice indeed! thank you Frank, I am looking forward to the comparison!